← Social media and performance: bane or boon? I missed seeing Carmen on Tap last summer, a version of Bizet’s masterpiece seen around the province (including Toronto) last summer. If I’d known that Maghan McPhee was in the show I would have made more of an effort to see it. I knew her when she was a young student –we sang at the same church—and recall a clear powerful soprano and a terrific sense of humour. Nowadays she seems to be mostly in Ottawa where she teaches voice at Carleton U and sang recently at the National Arts Centre. As luck would have it our paths haven’t crossed since then. I didn’t read the cast list for Carmen on Tap until just now as I was googling to see what she’s been up to: playing Micaela, the soprano who’s the natural foil to Carmen. 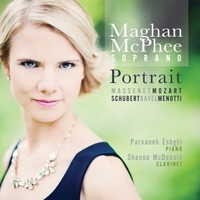 I’ve been listening to McPhee’s new CD Portrait, a collection of songs from a broad assortment of composers, namely Massenet, Mozart, Schubert, Ravel and Menotti. McPhee is well matched by Parvaneh Eshghi piano, each of the five composers requiring a different sound at the piano. This is no longer a student’s voice but a mature singer with full command of her instrument, precise in her attacks, and stylish in her approach to the songs. The collaboration between Eshghi & McPhee makes a very different sort of music for each composer. If one uses such diverse styles in a “Portrait” this must be a person of multiple dimensions. The Massenet shines with the warmth of a summer morning, a happy celebration of life & love. Massenet rewards the good singer by offering wonderful expressive phrases, not for the faint of heart but delicious if sung with enough accuracy yet not so much as to be overly controlled. If one can find a true sense of abandon, you’re in heaven, which is very much how McPhee lets her notes fly. McPhee truly lets go in the passionate phrases floating upwards without any difficulty. The Mozart group are more restrained: or at least the first ones are. The fourth is “Abendempfindung” , a song I’ve never encountered before, with a dark sense of gravitas suggestive of romanticism, or perhaps more accurately “sturm und drang”. It doesn’t sound like Mozart, but rather like a bold step beyond what he’d done before. McPhee gives it a noble urgency appropriate to the text. With the Ravel set things click especially well. McPhee sounds (again) totally fluid in French, floating the notes without any noticeable sense of effort. The music sounds playful & fun. When she comes to “Tout gai!“ the concluding number in the set, she’s hit her stride, and everything really is joyful. There are two more ambitious sections on the CD. Or the Schubert! I left mention of that until last, because it’s the most impressive. “Der Hirt auf dem Felsen” is an ambitious piece from Schubert intended to show off a virtuoso voice accompanied by piano and clarinet. Eshghi and McPhee are joined by Shauna McDonald clarinet. The vocal line soars as if through the wild mountainous terrain, arpeggiating and jumping full octaves and more. There’s an old recording by Elly Ameling that I admired, which she sings with great accuracy even if she sings everything –including the high B—very lightly. But I believe the song was meant to be sung by a powerful voice, in other words by a voice like McPhee’s, and she delivers. I can’t get it out of my head but then again, I don’t want to get it out of my head. I’ve listened to it four or five times in the past day or two. I’d call it the highlight of the album, although the Mozart & the Ravel and the Massenet are all pretty good too. And in case you had any doubts, next time she’s in town I’ll make more of an effort to get out to hear her sing. This entry was posted in Music and musicology, Reviews and tagged Franz Schubert, Giancarlo Menotti, Jules Massenet, Maghan McPhee, Maurice Ravel, Parvaneh Eshghi, Wolfgang Amadeus Mozart. Bookmark the permalink. I look forward to hearing Maghan. BTW, the high B in “The Shepherd on the Rock” is written to be sung softly – difficult to achieve. Most of the rest of this glorious piece must balance with the clarinet and piano, and is somewhat more robust in character. Thanks for that! i’ll have to look at the score to see for myself. Ameling does sing it softly but it doesn’t sound right to my ear (jaded admittedly by too much opera).